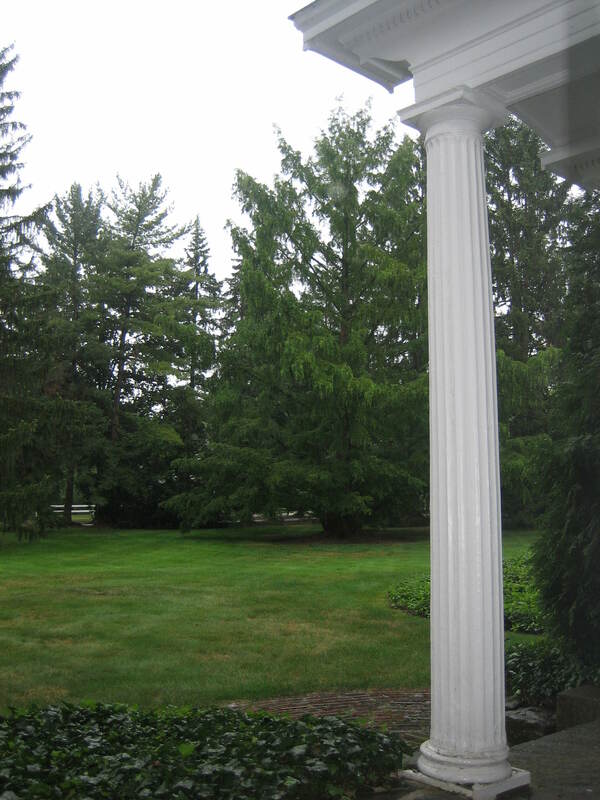 As I sat on my porch this morning getting ready to write my letter of the day, I gazed out the window and it sure looked like rain was on the way. It wasn’t but a few minutes later that the rain did come – and a welcome visitor it was. Hudson has been very dry lately and all the trees and plants have been mighty thirsty. Any hour, any day, any situation, is a good time to write a letter, but sitting peacefully while watching and listening to the music of raindrops is an especially delightful accompaniment to letter writing. 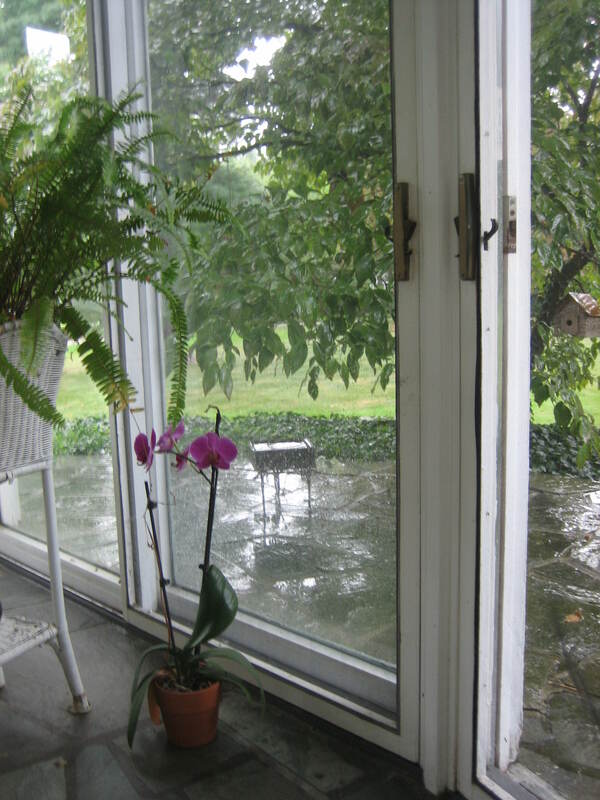 I pulled out my stationary and pen, sipped my morning coffee, and enjoyed the raindrops bouncing against the flagstone as I pondered just what to say in my letter to favorite pen friend Joy. I was answering a sweet little package she recently sent me… yes, I mean package. Joy is always surprising me with the creative-looking letters she sends my way. This time Joy put pages of blue-lined letter paper into a little white bag, the bag was decorated with delightful pictures. This bag then went into her envelope. 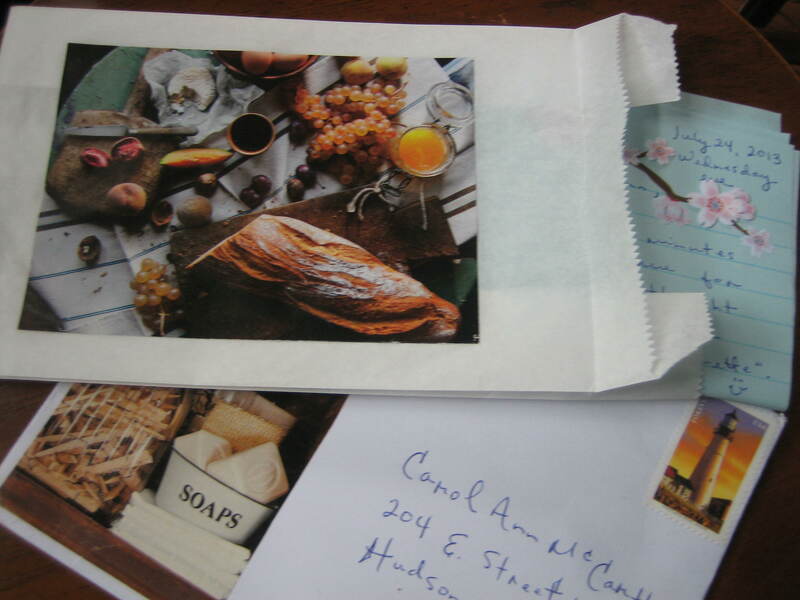 It never ceases to amaze me how many different ways Joy will package her letters to me. Such visual fun she offers all her lucky correspondents. So what could I now send Joy that might delight her half as much? I hope the recipe will please all of us, especially Joy, but I also wanted to send her another thing, a Friendship Book. Have you ever heard of Friendship books? Most people in the States haven’t, but my pen friends over seas seem to know all about them. They send me Friendship books in most of their letters. Friendship books come in all shapes and sizes with various looks. 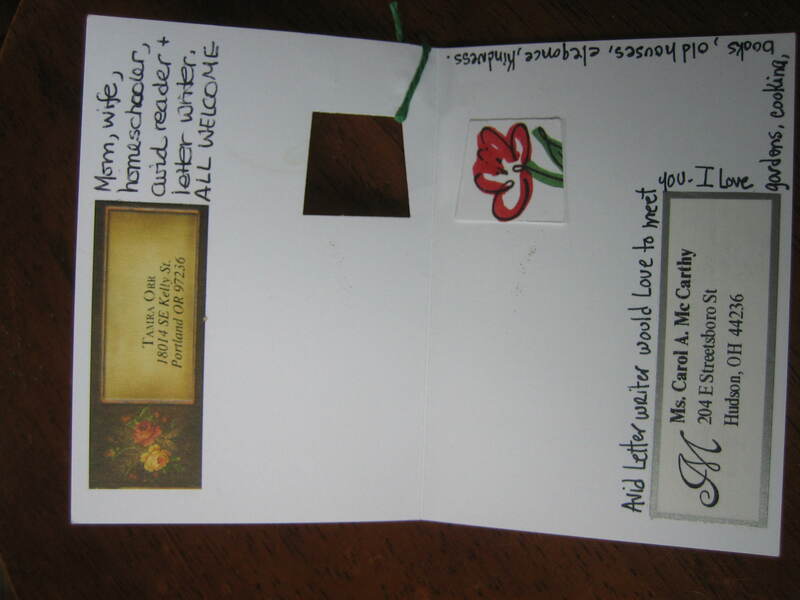 They’re usually quite small, 4 x 6 inches or smaller, so they can easily be tucked into a letter envelope. Inside the little Friendship book people put their names , addresses, a list of their favorite things, and they either say “Hello, just passing through”, or they say, “Please write me”. The book is signed and then is sent off in a letter to another friend who signs the book and passes it on again. The last page of the book will say “When full please return to”…. and the name and address of the creator will appear. 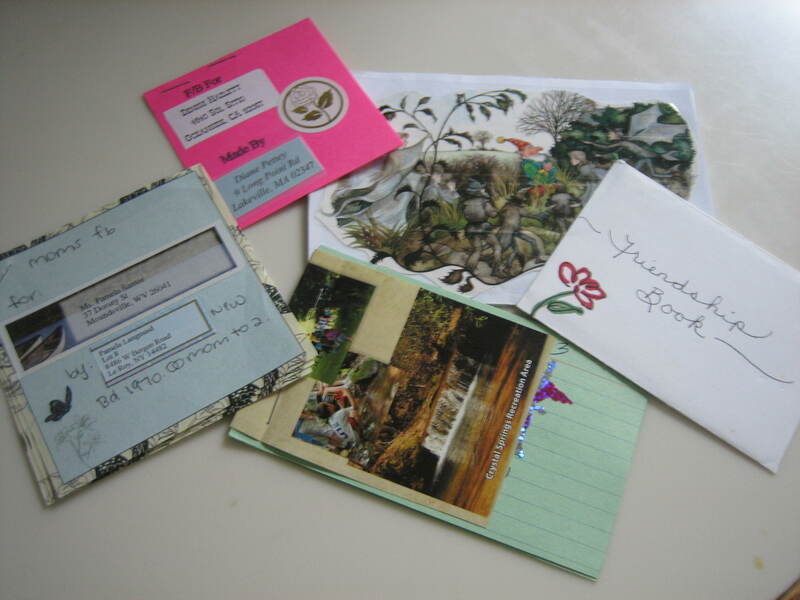 It’s really fun to see how these little books get around, and all along their travels they give letter writers the opportunity to connect. I have found many delightful correspondents with the help of these little jewels. Some people design darling little Friendship books. Here’s one created by my pen friend Tamra. She lives in Portland, Orgeon. Take a look inside. People fill the little books in as they please. There are no rules. 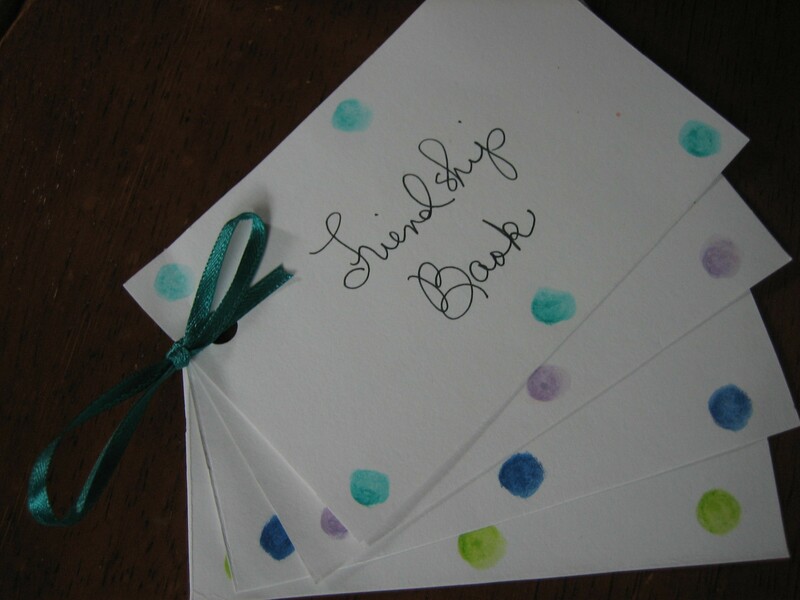 You can create your own Friendship books any way you like. If you get in the habit of inserting one in each of your letters you can feel proud that you’re helping to spread love and friendship around the world. It’s fun, especially when, like a boomerang, your Friendship books start returning to you filled with new perspective letter friends. I like to create my Friendship Books using ribbon and polka dots. If you’re one of my correspondents it’s just a matter of time before a Friendship book will arrive in a letter from me to you. There are so many things to enjoy in life and many of them can be shared in letters. 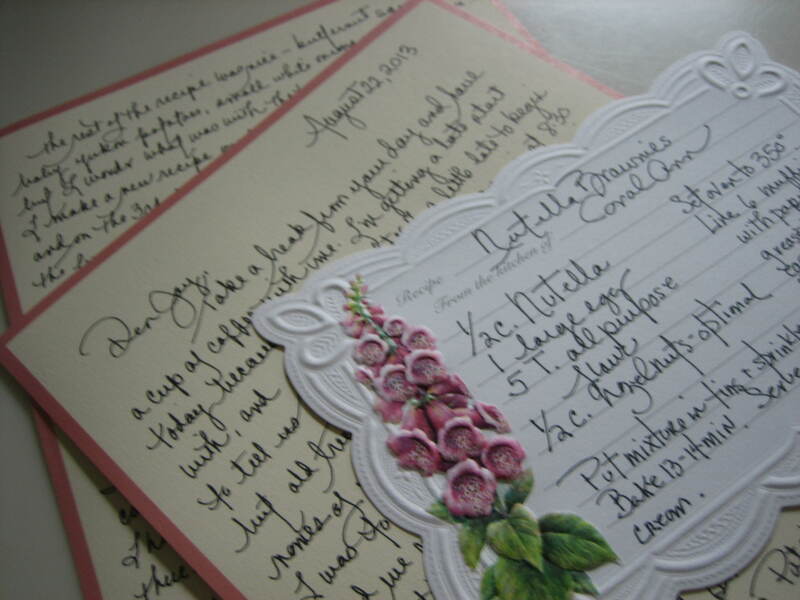 Tasty recipes and Friendship Books are two things I especially enjoy sharing in my letters. I wonder what you like to share in your letters. Maybe you’ll write and tell me. I’m always open to new ideas. So write a comment on this post. Write a letter to me. Write a letter to someone else. 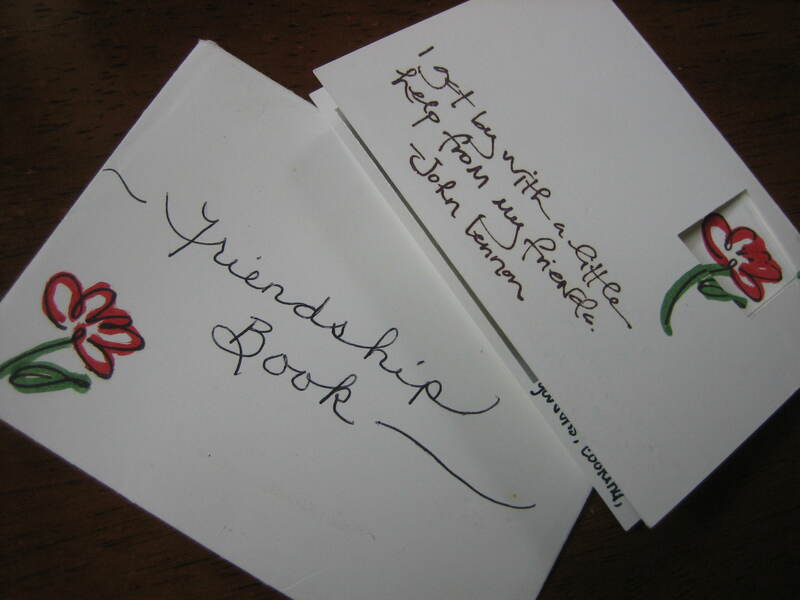 I’ve never heard of “Friendship Books” ~ what a cute idea! May have to start one of my own. Like I said, people in the States are unfamiliar with Friendship books. I’ll have to make one for you when next I write. I was lucky to get one of your friendship books and it was adorable. Gwen, It was nice to see your message this morning when I woke up for guess who I was planning to write today with morning coffee? YOU! Watch for my letter and don’t be surprised if you see one of your pretty letters in my next post. If this is a compliment I say thank you kindly. Hope your breakfast was yummy. I am just about to make some eggs benedict. I can’t help but wonder what sort of homework your friend was doing. In any case, I’m glad I could help. Thanks for the compliment and I’m happy I could help.